Antineutrophil cytoplasmic antibody (ANCA)–associated vasculitis exhibits endothelial damage, but the capacity for vessel repair in this disorder is not well understood. Here, we observed a marked increase in serum levels of soluble Flt1 (sFlt1), a potent inhibitor of vascular endothelial growth factor, in patients with active ANCA-associated vasculitis compared with patients during remission and other controls. Serum levels of sFlt1 correlated with C5a, an anaphylatoxin released after complement activation. Serum from patients with acute ANCA-associated vasculitis disrupted blood flow in the chicken chorioallantoic membrane assay, suggesting an antiangiogenic effect. Preincubation with excess human vascular endothelial growth factor prevented this effect. Anti–proteinase-3 (PR3) mAb and serum containing PR3-ANCA from patients with active vasculitis both induced a significant and sustained release of sFlt1 from monocytes, whereas anti-myeloperoxidase (MPO) mAb or polyclonal antibodies did not. However, the serum containing polyclonal PR3-ANCA did not induce release of sFlt1 from cultured human umbilical vein endothelial cells. In summary, these data suggest that anti-PR3 antibodies, and to a much lesser extent anti-MPO antibodies, increase sFlt1 during acute ANCA-associated vasculitis, leading to an antiangiogenic state that hinders endothelial repair. ANCA ultimately cause endothelial damage by activating circulating leukocytes and releasing various proteases, and the number of detached apoptotic endothelial cells in the circulation seems to correlate with disease activity in patients with AAV.12 Moreover, the number of circulating CD34+ hematopoietic progenitor cells and, to a lesser extent, endothelial progenitor cells, which may contribute to the repair of damaged microvasculature, tend to increase during the remission phases of AAV.13,14 Despite increased understanding of angiogenesis and the critical role of vascular endothelial growth factor (VEGF) in mediating vessel repair, little is known regarding the regulation of endothelial cell survival and vessel regeneration in patients with AAV. In this study, we assessed the role of sFlt1 in patients with AAV, diseases characterized by monocyte activation and in which alternative complement components have been implicated in their pathophysiology. We measured sFlt1serum levels in patients with AAV at different disease points and investigated whether increased sFlt1 leads to an effective antiangiogenic state in these individuals. Circulating sFlt1 levels were significantly increased during acute ANCA-associated vasculitis in patients with PR3-ANCA (mean, 7304 pg/ml; range, 321–47,355 pg/ml) and MPO-ANCA (2242 pg/ml; range, 31–16,851 pg/ml) compared with controls (120 pg/ml; range, 82–168 pg/ml) (PR3-ANCA versus controls, P<0.0001; MPO-ANCA versus controls, P<0.001) and with hemodialysis patients (214 pg/ml; range, 66–282 pg/ml) (PR3-ANCA versus hemodialysis controls, P<0.001) (Figure 1). sFlt1 levels in patients with anti-GBM disease were increased but did not significantly differ from controls (1584 pg/ml; range, 82–7642 pg/ml; P=0.054 versus controls). sFlt1 levels decreased significantly during disease remission in patients with PR3-ANCA (429 pg/ml; range, 46–2467 pg/ml) and MPO-ANCA (263 pg/ml; range,77–696 pg/ml) and were not significantly different from healthy controls. Serum sFlt1 levels in patients with PR3- and MPO-associated vasculitis during acute disease or during disease remission. A, acute disease; CT, healthy controls; GBM, patients with anti-GBM disease; HD, hemodialysis patients; R, remission. *P<0.0001 for PR3 A versus CT, and **P<0.001 for PR3 A versus PR3 R, MPO R, and HD. ***P<0.001 for MPO A versus CT. In 18 patients with paired sFlt1 measurements, there was a significant decrease in sFlt1 between the acute disease and remission samples taken 3 months after disease onset (Figure 2A) (P=0.0026, paired t test). Serum sFlt1 levels are increased during acute PR3-associated vasculitis. (A) Serum sFlt1 levels (log scale) in 18 patients with PR3-associated vasculitis at the disease onset and at 3-month follow-up. †P=0.0026, paired t test. (B) Serum C5a levels in acute and remission ANCA-associated vasculitis samples and from healthy controls demonstrating significantly elevated levels in acute disease compared with disease remission and those found in healthy controls. CT, healthy controls. ††P=0.001 for ANCA-associated vasculitis acute versus remission and controls. Serum sFlt1 correlated with the degree of proteinuria (r2=0.35; P<0.01) but did not correlate with the percentage of crescents in kidney biopsies performed in 12 patients with ANCA-associated vasculitis for whom serum samples and renal tissue were synchronously available. Serum C5a levels were significantly elevated in acute PR3-ANCA samples (290% of normal) and MPO-ANCA (180% of normal) samples compared with healthy controls and the paired remission PR3-ANCA and MPO-ANCA samples (P=0.001, one-way ANOVA) (Figure 2B). C5a levels correlated with sFlt1 levels (r2=0.337, P=0.026, one-tailed Spearman rank test). We used the chorioallantoic membrane (CAM) assay, a well established model of angiogenesis, to determine whether the increase in sFlt1 serum levels in AAV patients leads to an antiangiogenic state. Serum from patients with acute PR3-ANCA–associated vasculitis (n=5) displayed a clear effect in the CAM assay, with early disruption of blood flow (Figure 3, A and B). The effect was detected as early as 1 hour after serum was laid upon the CAM and was maximal at 3 hours (Figure 3I). PBS and serum from healthy controls (n=5) had no effect in the CAM assay (Figure 3, C and D). Serum from acute PR3-associated vasculitis disrupts blood flow in the CAM microvasculature. Representative pictures of distinct CAM areas treated with the following: (1) serum from a patient with acute PR3-associated vasculitis (A, original magnification, ×31.25 and B, original magnification, ×34); (2) PBS (C, original magnification, ×31.25), (3) healthy control serum (D, original magnification, ×31.25); (4) low molecular (10 kD) (E, original magnification, ×31.25) or high molecular (0.010 kD) (F, original magnification, ×31.25) mass fraction of the serum from a patient with acute PR3-associated vasculitis; and (5) serum from a patient with acute PR3-ANCA–associated vasculitis without (G, original magnification, ×34) or with preincubation (H, original magnification, ×34) with human recombinant VEGF. (I) Semiquantification of the effect of acute anti-PR3–associated vasculitis or control (CT) sera on the microvasculature of the treated CAM area. The effect was graded from 1 to 4 depending on the area of the treated CAM in which microvasculature was still visible 3 hours after the deposition of serum: grade 1 (0%–25% of total treated area), grade 2 (26%–50%), grade 3 (51%–75%), and grade 4 (76%–100%). ‡P<0.0002, paired t test. Serum from one patient with acute PR3 vasculitis was filtered using a semipermeable membrane with a cut-off of 10 kD. 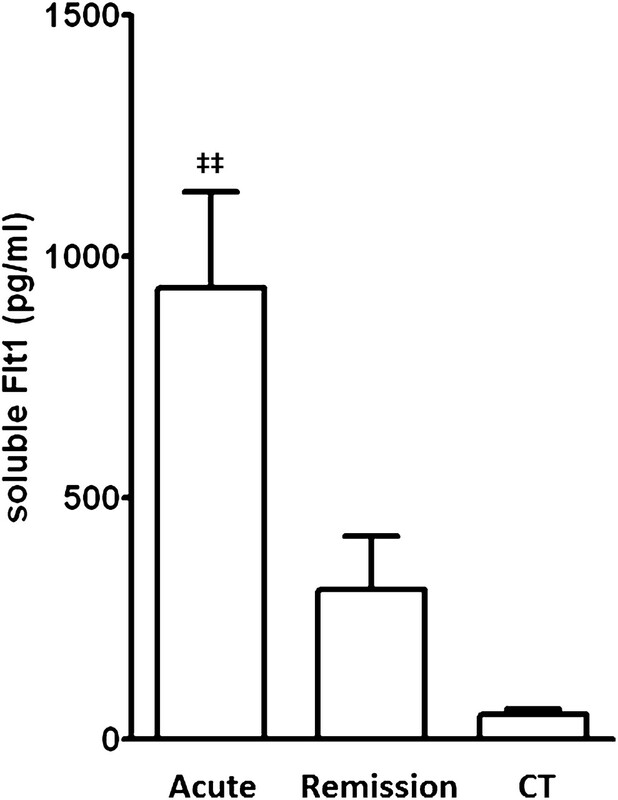 The filtrate, containing molecules with molecular mass <10 kD, did not display any effect in the CAM assay, whereas the concentrate containing molecules with a molecular mass >10 kD (which would include sFlt1) had the same effect as unseparated serum on CAM microvasculature (Figure 3, E and F). Serum from patients with acute PR3-ANCA–associated vasculitis (n=2) was tested in the CAM model with and without prior incubation (2 hours at 37°C) with an excess of recombinant human VEGF. Preincubation of patients’ serum with VEGF reversed the effect of the serum in the CAM assay (Figure 3, G and H). We aimed to assess whether sFlt1 secretion by monocytes was stimulated by the complement anaphylatoxin, C5a, or by anti-PR3 or anti-MPO antibodies. Human monocytes were stimulated with TNF-α (1000 U/ml) for 45 minutes and incubated for 2, 4, 8, and 16 hours with one of the following: (1) anti-PR3 mAb with or without further addition of C5a (10 nM) for 2 hours; (2) anti-MPO mAb with or without further addition of C5a (10 nM) for 2 hours; (3) polyclonal anti-MPO IgG purified from 3 patients with MPO-ANCA–associated vasculitis with or without further addition of C5a (10 nM) for 2 hours; or (4) human recombinant C5a at increasing concentrations of 10, 25, 50, and 100 nM. TNF-α per se did not induce any sFlt1 secretion by monocytes. Similarly, C5a failed to induce a significant sFlt1 release by monocytes at any concentration or time point, despite detection of the C5a receptor on the surface of human monocytes by flow cytometry (data not shown). Anti-PR3 mAb induced sFlt1 release by monocytes as early as 4 hours after incubation. sFlt1 levels peaked at 8 hours and remained significantly increased at 16 hours of incubation (Figure 4A). 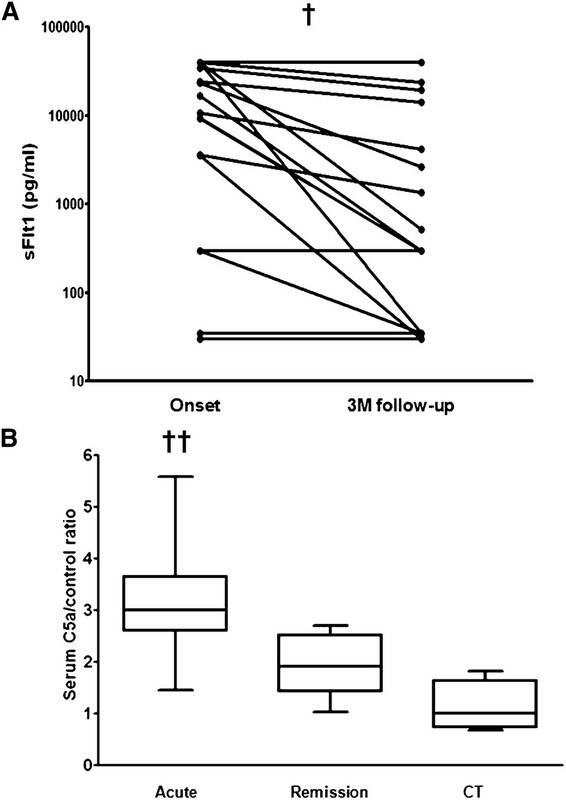 Anti-MPO mAb induced a lesser and more delayed (detectable only at 16 hours) increase in sFlt1 release from monocytes compared with anti-PR3 antibody (Figure 4B). A very mild increase in sFlt1 levels was detected after incubation of monocytes with polyclonal anti-MPO IgG (Figure 4C). Monoclonal anti-PR3 antibody induces sFlt1 release from monocytes. (A) An anti-PR3 mAb (10 μg/ml) induced sFlt1 release by human monocytes as early as 4 hours of incubation. sFlt1 release peaked at 8 hours and remained significantly increased at 16 hours. Further addition of C5a (10 nM) for 2 hours did not alter sFlt1 release. Data are from five independent experiments. CT, isotype-matched control. §P<0.001 versus 2-hour, 4-hour, and IgG isotype-matched control (CT) groups. #P<0.01 versus 2-hour, 4-hour, and IgG CT groups. (B) An anti-MPO mAb (10 μg/ml) induced a mild sFlt1 release by human monocytes only after 16 hours of incubation. Further addition of C5a (10 nM) for 2 hours did not alter sFlt1 release. Data are from three to four independent experiments. #P<0.01 versus 2-hour, 4-hour, and IgG CT groups. (C) Polyclonal anti-MPO antibody (10 μg/L) purified from 3 patients with anti-MPO vasculitis induced a very mild increase in sFlt1 release by human monocytes after 8 and 16 hours of incubation. Further addition of C5a (10 nM) for 2 hours did not alter sFlt1 release. Polyclonal anti-MPO IgG from each patient were tested in three independent experiments. We then tested whether sFlt1 release by monocytes upon stimulation with anti-PR3 antibodies arises at least in part from the cleavage of membrane-bound Flt1 ectodomain caused by the ADAM/TACE family of metalloproteases. 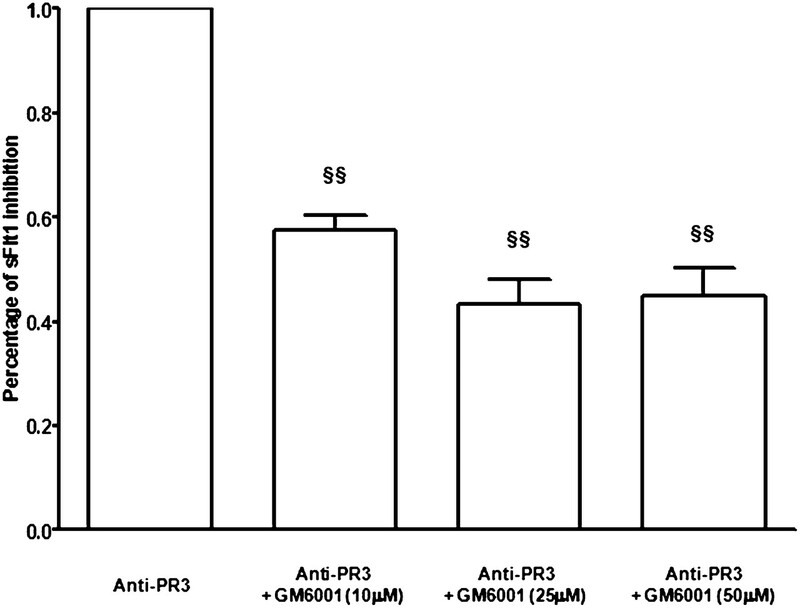 Preincubation of monocytes with a metalloproteases inhibitor, GM6001, partially blunted sFlt1 release by monocytes stimulated with anti-PR3 mAb (Figure 5). An antimetalloprotease inhibitor partially blunted sFlt1 release by monocytes stimulated with anti-PR3 mAb (10 μg/L). 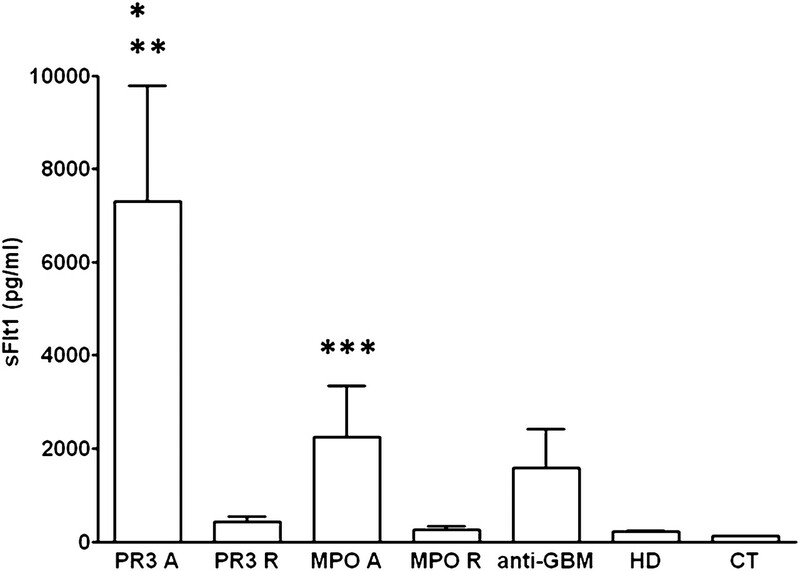 Monocytes were pretreated with a metalloprotease inhibitor GM6001 (10, 25, or 50 μM for 1 hour at 37°C) before incubation with anti-PR3 mAb for 16 hours. §§P<0.001 versus anti-PR3. On the basis of previous results with ANCA in vitro, we aimed to assess the effect of patients’ sera on sFlt1 release by monocytes. After 16 hours of incubation with serum from patients with acute PR3-ANCA–associated vasculitis (n=12), human monocytes increased sFlt1 secretion compared with serum obtained during disease remission or from healthy controls (Figure 6) (P<0.001). Serum obtained during PR3-AAV remission did not significantly increase sFlt1 secretion by monocytes compared with control serum (P>0.05). Serum (10%) from 12 patients with PR3-ANCA during acute ANCA-associated vasculitis induced significantly more sFlt1 release by monocytes after 16 hours of incubation, compared with serum from the same patients during disease remission or control serum. CT, control. ‡‡P<0.001 versus all other groups. Serum from patients with acute MPO-associated vasculitis (n=6) did not induce any significant sFlt1 release by monocytes after 16 hours of incubation. Four distinct sFlt1 isoforms were previously reported in several organs, including the placenta. Using real-time quantitative PCR, we tested for the presence of the four various isoforms’ transcripts in monocytes at baseline and after incubation for 2 hours with anti-PR3 antibodies. Isoforms 1 and 2 were predominant, whereas transcripts of isoforms 3 and 4 were barely detectable (Figure 7). sFlt1 isoforms 1 and 2 were predominant in monocytes at baseline and after stimulation (1 hour) with anti-PR3 antibodies, whereas isoform 3 and 4 transcripts were barely detectable. A representative result of sFlt1 isoforms RT-PCR is shown (among three independent experiments). Human umbilical vein endothelial cells (HUVECs) constitutively secrete sFlt1 in vitro (Figure 8). Incubation for 2, 8, and 16 hours of HUVECs with anti-PR3 mAb, C5a, or serum from patients with acute PR3-ANCA–associated vasculitis did not significantly increase sFlt1 secretion by HUVECs in vitro compared with control serum (P>0.05) (Figure 8). Serum drawn from patients with acute PR3-associated vasculitis does not alter sFlt1 release from HUVECs. Serum (10%) from patients with acute (PR3A) or remission (PR3R) PR3-ANCA– associated vasculitis did not induce an increase in sFlt1 secretion by HUVECS in vitro after 2 (A), 8, or 16 hours (B) of incubation compared with controls (CT). Similar results were obtained using purified C5a or an anti-PR3 mAb (data not shown). Data are from four to five independent experiments. The pathologic hallmark of AAV is an intense necrotizing capillaritis. Treatment of patients with AAV is aimed at suppressing cellular- and humoral-mediated damage by using corticosteroids and immunosuppressive drugs, as well as additional plasma exchange in more severe cases.25–28 However, despite intense treatment, the initial endothelial insult often progresses to chronic vascular damage that translates into irreversible organ damage, primarily CKD. Currently, we do not specifically target endothelial damage or promote vascular repair. In a recent study, one of four patients with ANCA-associated vasculitis and renal involvement reached ESRD; in almost half of the patients, this was because of the progression of chronic renal scars without active vasculitis.29 These findings suggest that endothelial cell survival and neo-vasculogenesis during the acute phase of ANCA-associated vasculitis are likely crucial to avoiding long-term organ failure. To our knowledge, this is the first study to address the issue of antiangiogenic factors in AAV, and our results clearly demonstrate that an increase in serum antiangiogenic factors occurs during the acute phase of ANCA-associated vasculitis. Circulating levels of sFlt1, a potent VEGF inhibitor, were significantly increased during acute ANCA-associated vasculitis and this increase was most marked in patients with PR3-ANCA. The more chronic lesions seen in MPO-ANCA–associated disease, which frequently manifests with more scarring at presentation,30 may suggest that the peak effect in MPO-ANCA–associated disease may have preceded the clinical presentation. sFlt1 serum levels were also increased in anti-GBM disease, which is another form of antibody-mediated renal capillaritis, even though the difference compared with controls did not reach statistical significance, which is most likely because of the limited number of patients with anti-GBM disease included in this study. However, this finding suggests that an increase in sFlt1 release, and hence a possible antiangiogenic state, may occur in various disorders that primarily target the vasculature and are mediated through monocyte/macrophage effectors. Our findings suggest that monocytes (and not endothelial cells) are the primary source of sFlt1 in patients with AAV. Serum from patients with acute PR3-ANCA–associated vasculitis induced the release of sFlt1 by human monocytes in vitro but had no effect on the secretion of the latter by HUVECs. In addition, HUVECs did not express C5aR constituently (which was also documented previously) or after stimulation with anti-PR3 mAb, which may account for the absence of sFlt1 secretion by HUVECs upon stimulation with AAV sera or exogenous C5a (current study). However, differences exist between HUVECs and microvascular endothelial cells in the kidney and lung. Similarly, endothelial cells do not constitutively express MPO or PR3 but may bind both antigens in vivo during ANCA-associated vasculitis. Thus, we cannot exclude the possibility that microvascular endothelial cells in vivo express C5aR and/or bind PR3 or MPO and therefore may contribute to the increased sFlt1 levels found in patients with AAV. Recent studies suggested that C5a, a central component of complement system, is a major driver of sFlt1 release by monocytes. Complement, a major player of the innate immune response, is a complex proteic cascade that can be activated through three distinct pathways: the classic, the lectin, and the alternative pathways. The three pathways differ with regard to their triggering factors, but converge at the generation of C3 and C5 convertases.39 The latter cleaves C5 and generates C5a, a proinflammatory anaphylatoxin, and C5b that mediates the formation of the C5b-C9 terminal membrane attack complex (MAC), which induces lytic lesions in targeted cell membranes. In addition, recent experimental data underscored the importance of the complement alternative pathway in the genesis of ANCA-associated vasculitis. In a murine passive transfer model using anti-MPO antibodies, C5−/−, C5a receptor−/−, and Factor B−/− mice (but not C4−/− mice) were protected from the induction of ANCA-associated vasculitis.40 ANCA-primed neutrophils released an as-yet-unidentified factor(s) that activated complement and released C3a and C5a.41 C5a, in turn, primed neutrophils for ANCA-mediated oxidative burst. In this study, C5a serum levels were indeed increased during the acute phase of ANCA-associated vasculitis, in keeping with complement activation. Moreover, C5a levels correlated with serum sFlt1 levels. However, in contrast to a previous report,23 C5a at concentrations ≤100 nM failed to induce sFlt1 release by monocytes in this study. This discrepancy may be related to different techniques used for monocyte purification, and thus different purity levels of monocytes and different techniques for C5a receptor blockade. Moreover, our results show that anti-PR3 antibodies, and to a much lesser extent anti-MPO antibodies, induced sFlt1 release by monocytes, independently of C5a. To our knowledge, this is the first demonstration of a direct effect of autoantibodies on sFlt1 release by monocytes. This effect is an additional illustration of monocyte activation by ANCA, and anti-PR3 antibodies in particular; however, why anti-PR3 antibodies display a more significant effect on sFlt1 release by monocytes compared with anti-MPO antibodies remains unknown. Our data also suggest that sFlt1 release by monocytes upon stimulation by anti-PR3 antibodies arises at least in part from the cleavage by ADAM/TACE metalloproteases of membrane-bound Flt1 ectodomain and the subsequent release of sFlt1. However, the precise mechanisms of ectodomain cleavage and its relative importance compared with the alternative splicing of Flt1 transcripts to generate sFlt1 in monocytes remain to be elucidated. Thus, in addition to their role in the recruitment and activation of neutrophils, monocytes and the genesis of endothelial inflammatory lesions during AAV, anti-PR3 antibodies induce an increase in the antiangiogenic factor, sFlt1, which hinders endothelial cell repair in this setting. The occurrence of such an antiangiogenic state in patients with PR3-associated vasculitis is corroborated by our data in the CAM model (Figure 3). To our knowledge, this study provides the first evidence of an increase in a potent antiangiogenic factor, sFlt1, and the occurrence of an antiangiogenic state in the setting of acute vasculitis affecting the renal microvasculature. Our data also indicate that sFlt1 may be a helpful marker of PR3-associated vasculitis activity and, most importantly, that anti-sFlt1–targeted therapies may be beneficial in treating acute disorders affecting the renal microvasculature. Reversing an antiangiogenic state or promoting a more proangiogenic state may help to enhance endothelial cell survival and repair and thus reduce renal vascular scars and ultimately the risk of progression toward ESRD. Serum samples were available for 40 patients with PR3-ANCA–associated vasculitis during active disease (n=20) or during remission (n=20), as well as for 23 patients with MPO-ANCA–associated vasculitis during active disease (n=10) or during remission (n=13). Eighteen additional patients with PR3-ANCA had paired serum samples drawn at disease onset and at 3 months of follow-up, when remission had been achieved. Seventy-nine percent of patients had renal involvement, defined by microscopic hematuria and proteinuria and/or elevated levels of serum creatinine and/or a kidney biopsy demonstrating focal necrotizing GN, which are typical features of ANCA-associated vasculitis. The remaining patients had predominantly pulmonary or ear/nose/throat involvement. Our control group included 18 healthy controls, 11 patients with acute anti-GBM disease, and 10 patients with ESRD who were undergoing hemodialysis. Patients were venesected as soon as the diagnosis of ANCA-associated vasculitis or anti-GBM disease was confirmed and before the start of treatment when possible. Wegener’s granulomatosis and microscopic polyangiitis were diagnosed according to the Chapel Hill Consensus conference criteria.42 Anti-GBM disease was defined by the presence of rapidly progressive crescentic GN documented by renal biopsy and/or alveolar hemorrhage and the presence of circulating anti-GBM antibodies by ELISA. GFR was estimated using the Modification of Diet in Renal Disease simplified formula.43 Circulating Flt1 and C5a levels were assayed using commercial ELISA kits according to the manufacturer’s instructions (R&D Systems, Minneapolis, MN). Patient sera containing PR3-ANCA taken at the time of acute disease (n=5) or healthy control sera (n=5) were assessed using the CAM assay, as previously described.18 CAM tests were also performed using the same PR3-ANCA–containing serum that was preincubated with excess human recombinant VEGF (0.5 ng VEGF/ml of serum) (Clonetics; Lonza, Basel, Switzerland) for 30 minutes (n=2). In further experiments, sera from the same PR3-ANCA–associated vasculitis patients were filtered through a semipermeable membrane with a filtration cut-off of 10 kD (Biomax-10; Millipore, Billerica, MA). Both the concentrate and the filtrate were tested in the CAM assay. All experiments were performed in three to six eggs, at 9 days after incubation, and replicated at least twice on separate occasions. Each egg received patient serum and PBS on two separate zones of the CAM. The effect of serum on the microvasculature was measured in a semi-quantified manner, based on the area of the CAM treated with serum in which microvasculature was still visible 3 hours after the treatment of the CAM area with serum: grade 1 (0%–25% of total area), grade 2 (26%–50%), grade 3 (51%–75%), and grade 4 (76%–100%). PBMC were extracted from blood using Ficoll (Eurobio, Les Ulis, France) and were directly frozen in trizol at −80°C (DTC platform; CHU de Nantes, Nantes, France). Monocytes were isolated using elutriation and were resuspended in RPMI (Gibco, Grand Island, NY) and supplemented with 1% FCS. We added 500 μl to each well of 24-well tissue-culture plates at a final concentration of 106 cells/ml and incubated at 37°C in a 5% CO2-humidified atmosphere. HUVECs (Lonza, Cologne, Germany) were cultured using the Bsal medium and supplement kit (Promocell, Heideberg, Germany). Cells were used between the third and fifth passage. After stimulation for 30 minutes with TNF-α (2 ng/ml), monocytes or HUVECs were incubated with one of the following: (1) a murine anti-human PR3 mAb (clone 12.8) (10 μg/ml) (Research Diagnostics, Acton, MA), a murine anti-human MPO antibody (10 μg/ml) (Abcam, Paris, France), polyclonal anti-MPO purified from patients with MPO-associated vasculitis (10 μg/ml), or with equal amounts of isotype-matched murine IgG for 2, 4, 8, and 16 hours; (2) serum (10%) obtained from 12 patients with PR3-ANCA–associated vasculitis during the acute disease phase and during remission (n=12), from six patients with acute MPO-associated vasculitis or healthy donors (n=7) for 16 hours; or (3) purified C5a (R&D Systems) at concentrations of 10, 25, 50, and 100 nM for 2, 8, and 16 hours. Some of these experiments were conducted with or without pretreatment of monocytes and HUVECs with an anti-C5a human receptor (C5aR) mAb (10 μg/ml) (R&D Systems) for 30 minutes. In additional experiments, monocytes were pretreated with a metalloproteases inhibitor GM6001 (Calbiochem, Beeston Nottingham, UK) at concentrations of 10, 25, or 50 μM for 1 hour at 37°C before incubation with anti-PR3 mAb. The blocking effect of anti-C5a receptor antibody has been tested by the manufacturer (R&D Systems) on the basis of its inhibition of N-acetyl-β-d-glucosaminidase release by U937 cells upon stimulation by C5a. Using flux cytometry, we also tested the capacity of this blocking antibody to inhibit C5a fixation on monocytes (Supplemental Material). Cell supernatants were harvested, cell debris was removed by centrifugation, and samples were stored at –20°C until further processing. To take into account the sFlt1 already present in the patients’ sera, sFlt1 levels were measured in the diluted patients’ sera (10%) used in this set of experiments, after 2-hour incubation at 37°C in a 5% CO2-humidified atmosphere, in the absence of monocytes or HUVECs. C5aR expression on monocytes and HUVECs was assessed by flow cytometry using a mouse anti-human C5aR (R&D Systems) and a fluorescein isothiocyanate-conjugated donkey anti-mouse IgG antibody (Jackson Immunoresearch, West Grove, PA). Data were analyzed using one-way ANOVA, paired t test, and Spearman rank correlation using Prism software (version 4; GraphPad, La Jolla, CA). This study was funded by a grant from Région Pays de Loire, France. S.L.R. and R.J.P. contributed equally to this work. A.D.S. and F.F. are senior co-authors. See related editorial, “Vasculitis Is an Antiangiogenic State,” on pages 8–10. This article contains supplemental material online at http://jasn.asnjournals.org/lookup/suppl/doi:10.1681/ASN.2010080858/-/DCSupplemental.